Is the inside of your home in need of repair? A P & W Services Est 1969 can help. 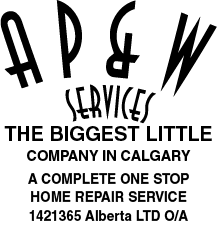 We offer interior home repair services for homes in Calgary. This includes window cranks, weatherstripping & small repairs. We are committed to providing a worry-free experience for each of our customers. We understand how important your home is to you; it’s where you spend your leisure time and care for your family. That’s why we’re dedicated to providing the most reliable, careful and experienced workers for each project. We discuss your expectations and needs with you, and we strive to offer the highest level of workmanship. Please note: we do not provide glass replacement or chip repairs. For more information about our interior repair services, give us a call!